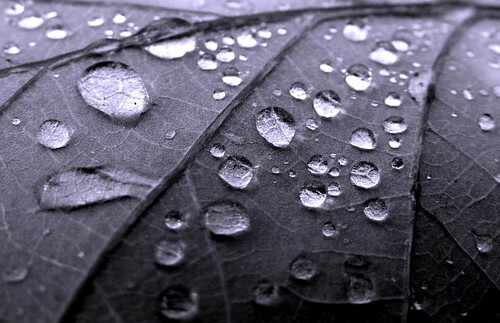 Raindrops on a Leaf, a photo by 1963chris on Flickr. Touching the ground is good. I love the way rain is described in this poem. It wasn't until I moved to the desert that I learned to appreciate how stunning and moving the rain could be. The way you described falling into the earth as nourishing new life was really intriguing. As if too say falling through the skies of life was not really an end but a beginning in the sense that through you a new start will occur. As the rain hits the ground and will in turn raise a new plant, or life. I very much enjoyed the comparison between rain and the solitary struggle we all face as individuals. So much wisdom, packed into three lines.